"Chair Massage" describes a type of massage that is performed while the client is fully clothed, making it ideal for an office setting or other less-than-private locations. The unique massage chair is ergonomically designed and offers full support of the head (face forward), arms, torso and legs. 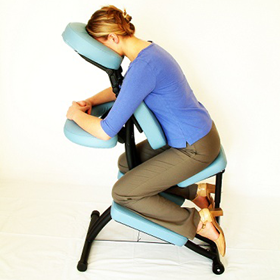 A chair massage is easy to set up and can be performed practiacally anywhere. A Chair Massage is performed by licensed massage therapists who use a combination of deep tissue and Swedish massage techniques, usually on the muscle groups in the neck, shoulders, back, arms and hands.